At Canberra Dental Care we know that snoring and sleep apnoea can impact your life in a number of ways. Probably the most obvious is the disturbance to your partner but it can also impact on your health. Sleep apnoea is characterised by pauses in breathing during sleep. Each pause can last for a few seconds to several minutes and they happen many times throughout the night. In the most common form, this follows loud snoring; often there is a choking or snorting sound as breathing resumes. Without a good night’s sleep your body doesn’t recharge which can lead to fatigue during the day. Both snoring and sleep apnoea are a consequence of obstructed or partially obstructed airways. When you sleep your airways should be open and clear to allow for both easy and silent breathing. If there is an obstruction it causes a reduction in air reaching your lungs. This can put significant strain on your heart and body as a whole. Just because you have some or all of these symptoms doesn’t mean you have restricted airways but it is definitely something you should see your dentist and associated practitioners (General Medical Practitioner and Sleep Physician) about. What treatment is available? And how can my dentist help? At Canberra Dental Care our dentists are specially trained to help with treating snoring and sleep apnoea. The first thing your dentist will do is review your condition. This will include an examination of your mouth, tongue, teeth, jaw joints, health of gums and any other issues present. They will then likely refer you for radiographs and a sleep study. Your dentist will talk to you about the assessment and what treatment is recommended. 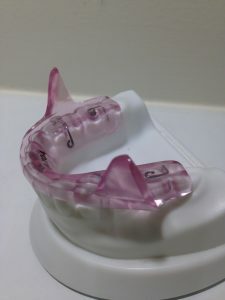 Two major treatment options are available; Continuous positive airway pressure (CPAP) and Mandibular Advancement Splint (MAS). 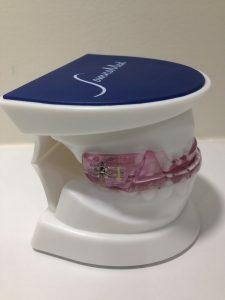 The treatment option available through the specially trained dentists at Canberra Dental Care is a custom made MAS (We use the SomnoDent© device). Your dentist will take multiple highly accurate impressions of your teeth and registration of the jaws so the device can be made to fit your mouth perfectly. 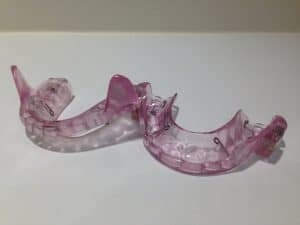 The MAS (Mandibular Advancement Splint) is upper and lower linking plates/mouthguards that you put into your mouth when you go to sleep. The device very gently adjusts the angle and position of your lower jaw to open your airway. 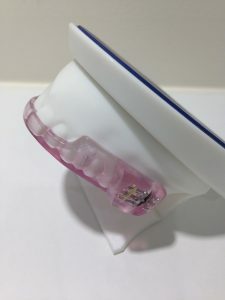 When your custom made SomnoDent© device has been made your dentist will make any minor adjustments if needed and provide you with the care and storage instructions needed to prolong the life of your device. Will my health fund reimburse me? You will need to check with your health fund as every health fund and policy is different. All of the treatment items have health Fund Code numbers, which you would be able to claim if a member. We have Hicaps so can process your claim for you when you checkout, but we do not know beforehand the benefit you will receive. See more information about Hicaps in our payment methods section. We will be able to advise you further after examining the mouth. We will not start or perform any additional treatment until you are aware of the costs and consented for us to do so. Like all treatments it will take you a while to get used to sleeping with the device in your mouth. A follow up sleep study is performed to check the device is working correctly and sleep quality/depth is improving. However your partner will be the best person to let you know if it is working and you should feel more rested and recharged when you wake. Remember, the device does only work if you put it in your mouth at night – unfortunately, even a SomnoDent© device cannot work from the storage glass by your bed!